Keep your favourite memories close with a small photo book from bonusprint. There are loads of great ways to customise your small photo album with our creator tool. And it couldn’t be easier to order your personalised book online. Small photo albums make great little gifts, and they’re ideal for taking your favourite photos with you when you’re away from home. 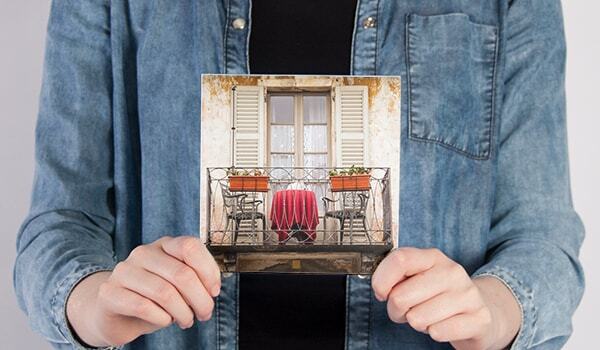 With a mini 10 x 10 cm photo book, you can easily flip through your family snaps. And why not gift a small 13 x 10 cm photo album as a keepsake for someone special? You can make a small photo book your own by personalising the cover with the photos you love. And if you pick the small landscape photo album, you can choose a hard book cover in linen, in faux leather faux leather or with a photo. To make your personalised photo book, head to our easy-to-use creator tool. You’ll see a range of sizes to choose from, including small, medium, large and extra-large photo books. You can also select the format that you want to print in. To personalise a mini photo album, select our smallest 10 x 10 cm design – even though this is too big to be pocket-sized, it’s perfect for popping in a small bag. And if you’ve already created a large landscape book for your home, you could recreate a smaller-sized photo album to share as a gift. Ready to order your small photo album? Whether you’re making a mini photo album or personalising an extra-large book, there are loads of fun ways to experiment with layouts and designs in our creator tool. Simply upload your images and play around with clip art, masks and more. When you’re happy, click ‘add to basket’ for the finishing touches. If you’ve created a mini 10 x 10 cm photo book or a 13 x 10 cm landscape book, you can select gloss paper for greater colour contrast. And all you need to do next is to confirm your order and have your photo book delivered to you.